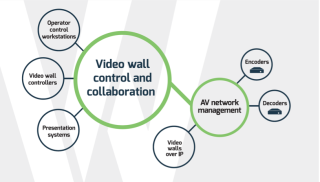 VuWall, the Canadian manufacturer of video wall solutions for control rooms and collaboration rooms, is introducing a unique product ecosystem strategy to bridge AV & IT, at this year’s ISE show in Amsterdam. VuWall states that the new ecosystem will be beneficial for integrators "who want to provide an outstanding control rooms experience to their customers." What makes the VuWall product line unique is that all products are based on the same core of VuWall2 software. The product range includes the VuScape video wall controllers, along with both VuStation, the line of personal video wall controllers and CoScape, the presentation and collaboration solution. Anyone who is familiar with VuScape will immediately be operational with CoScape and VuStation. This is true for the operator as well as for the AV integrator.